If you have granted the ModifySelf right to users on your system, they can pick a different theme for themselves by going to Logged in as -> Settings -> Options and selecting a different theme. RT has some built-in controls to manage the look of the theme you select. 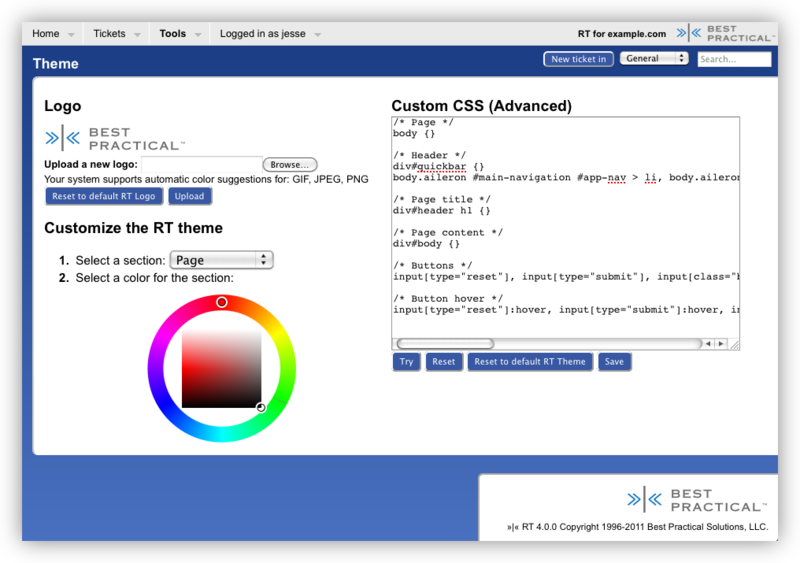 To use the Theme Editor, log in as a SuperUser (like root), and navigate to Tools -> Configuration -> Tools -> Theme. This technique is preferred to callbacks (below) because CSS included via this way will be minified. It is also included across all styles, unlike the callback technique. RT's CSS files are also Mason templates and the main CSS file, conveniently called main.css, has a Begin and End callback allowing you to inject custom CSS. You can use any name you want for the MyRT directory and the theme directory should correspond with the theme you want to change. RT will now evaluate the contents of that file after it processes all of the @import statements in main.css. You can call your "localstyle" directory whatever you want and you don't have to copy the aileron theme to start from, but it's a good place to start off for RT4. If you restart your RT it should look just the same (assuming you copied your current default theme), but if you go to your Options page you'll see that the system default theme is now your new "localtheme."